Rigid structure, highly waterproof DC 2-wire switches with improved visibility of indicator lamps. DC 2-wire, for reduced wiring costs. Rigid housing allows higher mounting torque. 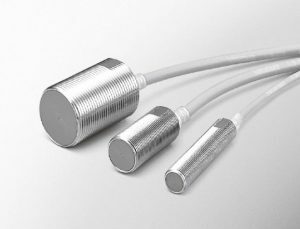 FL7M Series AC/DC 2-wire Type Cylindrical Proximity Sensors. The FL7M series AC/DC 2-wire cylindrical proximity sensors are no-polarity and can be used in applications with mixed power availability or just to consolidate part numbers and reduce man hours. They are compact and space-saving, sealed to IP67, and the indicator lamp can even be seen from the rear. They also have an enhanced circuit protection built-in.